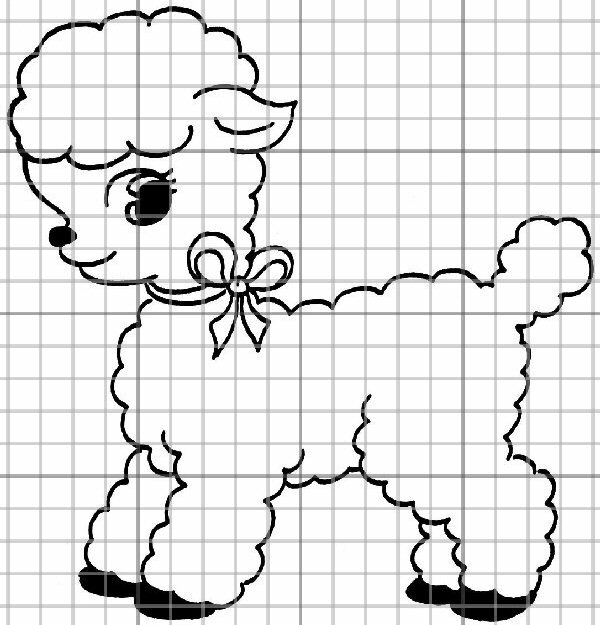 This cute lamb is an easy craft for young children to make using white cotton balls or purchased pom poms in any colour. Make your lamb large or small as you wish. Print the lamb and paste onto cardboard. You can use the graph lines to resize larger if you wish. Cut out the lamb shape. This is the adult’s role. If you make a smaller lamb, use smaller cotton balls or cut them in half, or use purchased small pom poms in white or other colours as you wish. Now give cotton balls or pom poms and children’s glue to a child and have him or her put a dab of glue onto the lamb and stick on a cotton ball until the lamb is covered. You can leave the eyes and nose black or glue on purchased eyes or button or pom pom eyes and nose. Tie a ribbon or glue a bow around the neck. Add sprinkles if you wish.